During the early part of this year quite a bit was written about the outperformance of small cap stocks versus large cap stocks. One commonly referenced reason for the outperformance was based on the trade and tariff issues and the potentially greater negative impact this would have on large cap stocks. It does seem though the trade issues are slowly being resolved and this headwind subsiding for markets broadly and for the large cap stocks in particular. As a potential consequence, the small cap outperformance has completely unwound and large cap stocks, as measured by the S&P 500 Index, are outperforming small caps as seen in the chart below. From an attribution perspective, small cap underperformance is tied to the strength in large cap technology related stocks as well as strength in cyclically sensitive stocks. The below attribution table shows the small cap underperformance of 165 basis point is tied mostly to underperformance in Consumer Discretionary, Technology and the Industrial sectors. The above seven stocks fall into three of the five sectors that comprise the MSCI USA Cyclical Sector Index. 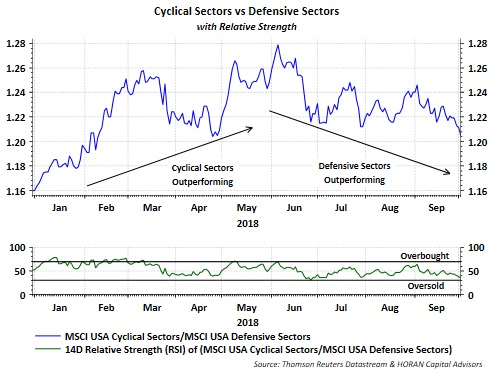 However, at nearly the same turning point that small caps began to underperform large cap stocks, the MSCI USA Cyclical Sector Index began underperforming the MSCI USA Defensive Sector Index. 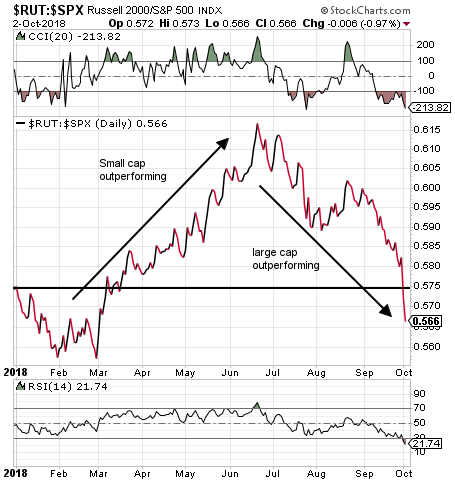 The underperformance of small cap stocks now and beginning to see the outperformance of the defensive sector index one might ask whether investors are becoming too cautious or not. Economic and company fundamentals continue to be positive and should be supportive of a favorable economic and market environment.